Whenever fiddleheads and ramps come into season, I can’t help myself. They’re so tasty! 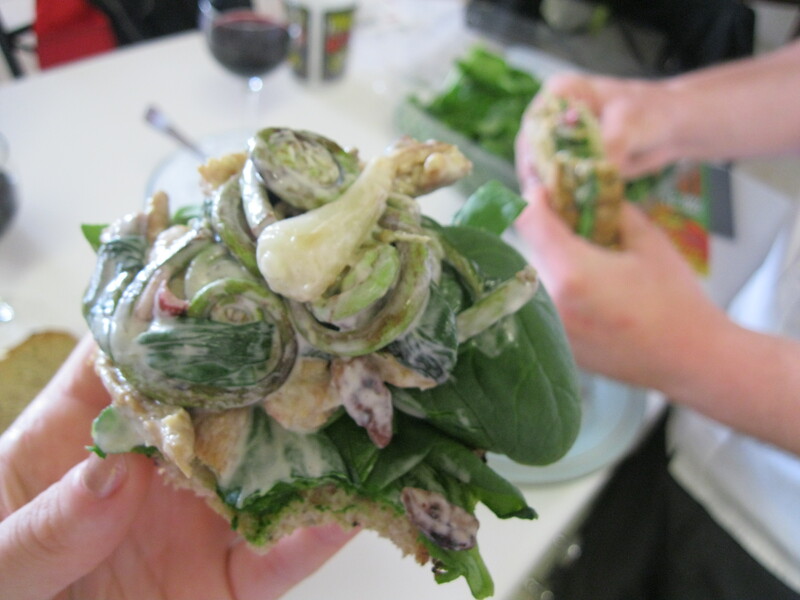 We’re revisiting a favorite, fiddlehead and ramp salad but this time we’re doing wraps instead of on top of toasted bread and including a new twist – lemon sorrel. This particular vegetable has a light herbal fragrance and a mellow lemony flavor that compliment the savory earthy salad well. We prepared the salad as before and then combined it with the lemon sorrel in a wrap. It was DIVINE! 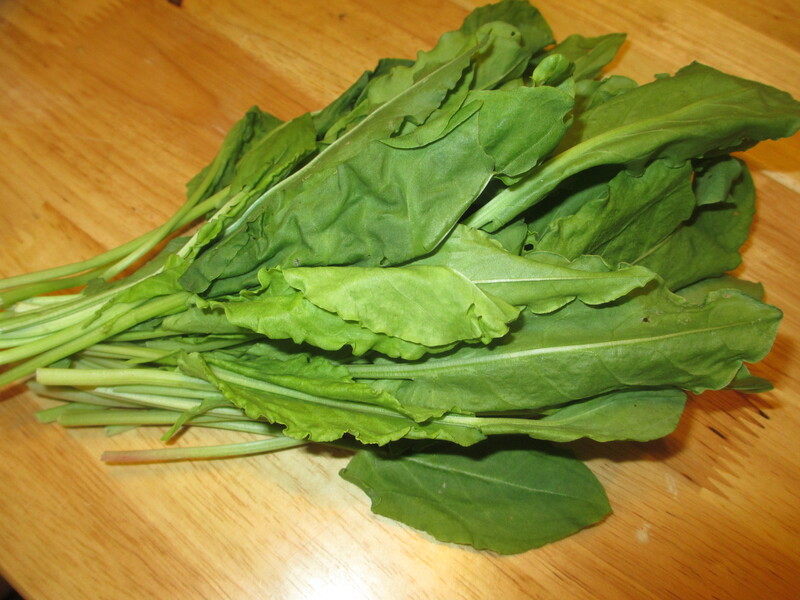 This particular leafy green was grown here in Florida. If you find it in your local market, TRY IT! Wild Morel and Fiddlehead Risotto! I love foraged foods. Mushrooms are one of those things that I can’t trust myself to do so I left this to the professionals and got some excellent results. Be really careful if you decide to forage for yourself: poisonous mushrooms are everywhere and usually they don’t cause anything more serious than some heinous stomach upset but even that isn’t worth it. Morels have a very distinctive features: a hollow core, stem attached at the rim of the cap and a honeycombed cap surface. 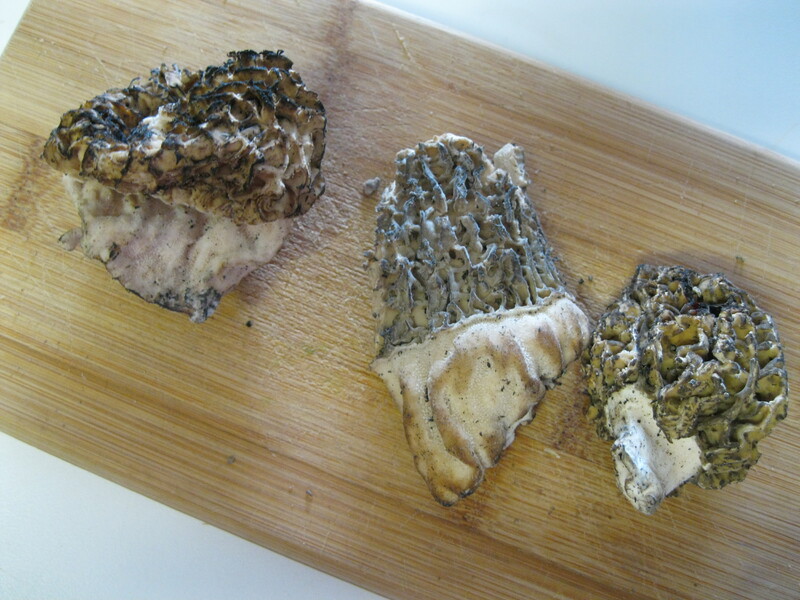 Whether you forage yourself or not, clean your morels carefully. Because they’re hollow inside and intricate on the outside, it’s not uncommon for them to be gritty before washing and to harbor… surprises… inside. Slugs, spiders and other critters might be taking a nap, so be careful to cut each one open before cooking. 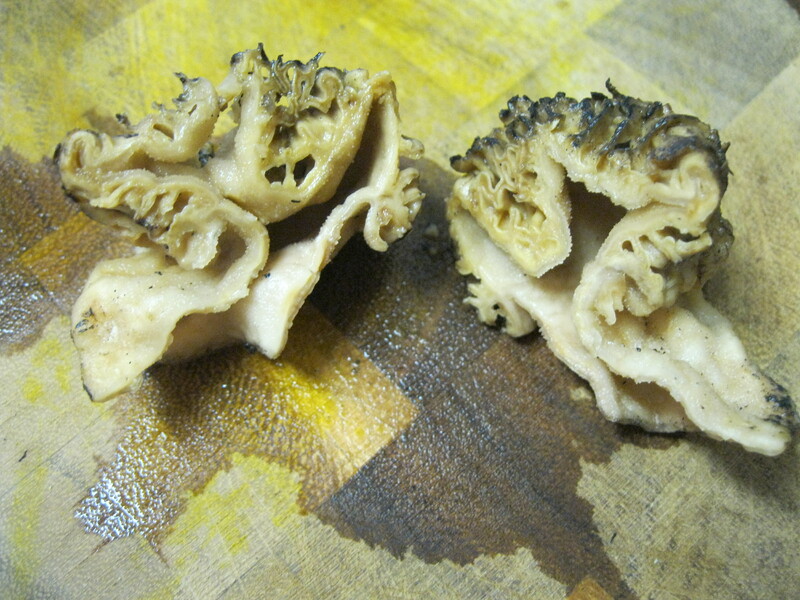 My next caveat about morels is that they need to be cooked thoroughly. They do contain compounds that can cause gastric upset if they’re not cooked well enough or you might have an unpleasant evening. That being said, some people are just sensitive to the compounds in morels, especially if they are trying them for the first time so consider using them sparingly and using conventional mushrooms for the bulk of the dish. 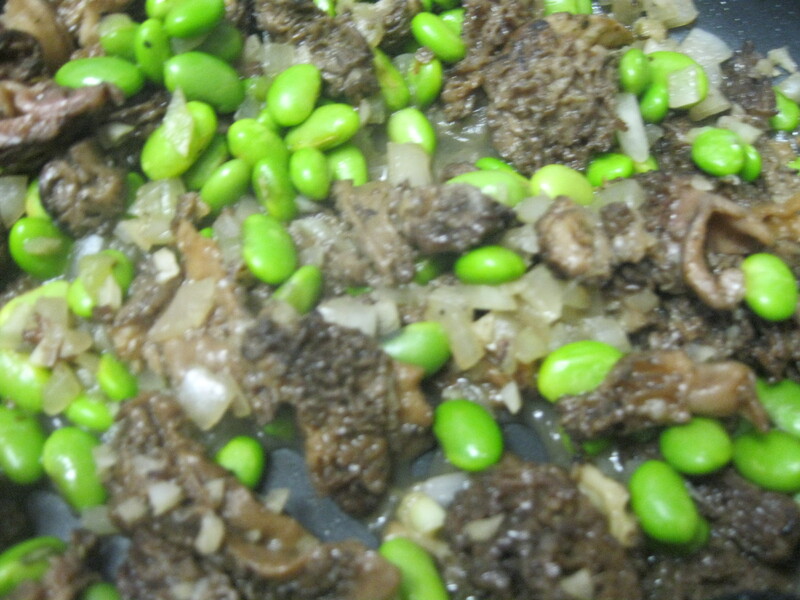 I sauteed mine in some olive oil with a chopped onion, 4 minced cloves of garlic and after the morels started t reduce, I added a cup of frozen edamame, peas are a great alternative if you’ve got a soy allergy. The risotto was prepared by putting a half cup of arborio rice into a saucepan along with a teaspoon of herbes de provence and a cup of white wine. I’m using chardonnay in this batch because I think the oak and vanilla flavors in the wine will bring out the earthy flavors in the morels.I added some whole Japanese hot red peppers to the broth I used to prepare the risotto. I combined a liter of water with a veggie bouillon cube and brought it to a boil. I added it one ladle at a time until I liked the texture. I fished the peppers out of the remaining broth and mixed in 1/4 cup of nutritional yeast and a tablespoon of Eat in the Raw vegan parmesan (omit this if you’re sensitive to nuts, it won’t affect the outcome of the dish significantly). 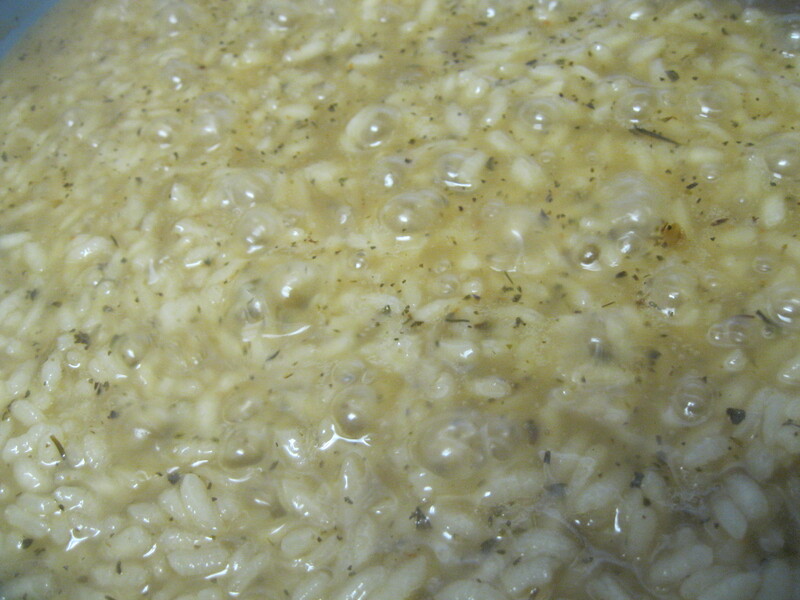 This makes the risotto creamy and cheesy… like you’d expect comfort food to be… just without the fat and cholesterol. 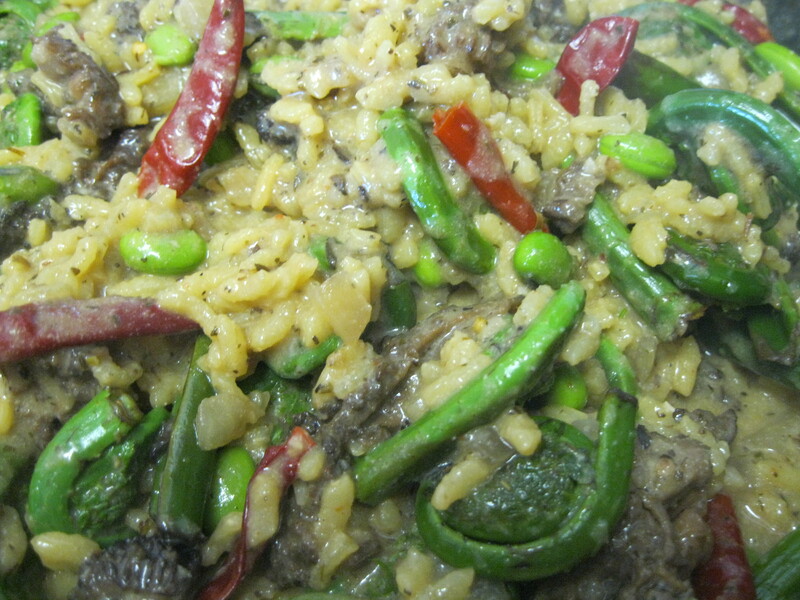 When that was done, I stirred the veggies into the risotto including the fiddleheads, which I sauteed lightly along with the morels and the edamame. This was delicious nutritious comfort food. Usually thost words don’t go together but when you’re vegan, they do. Here is Brent… showing off his bowl. 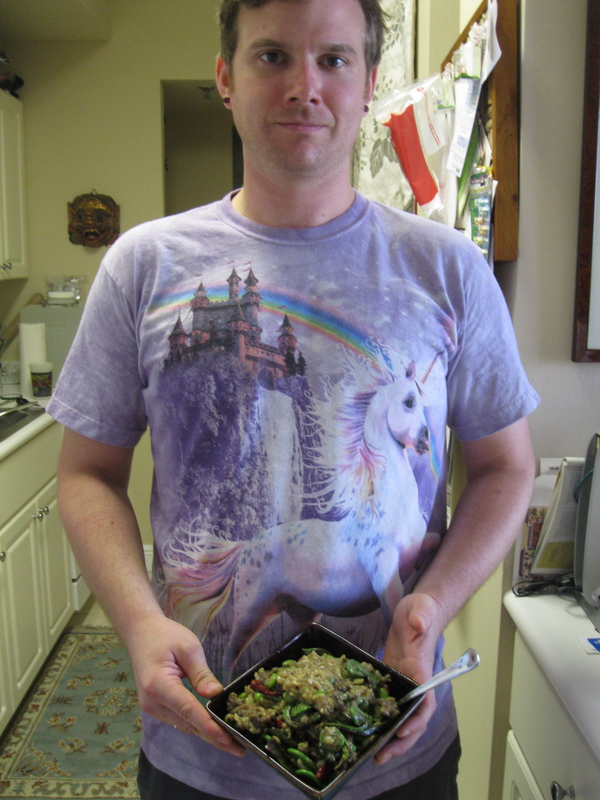 He’s also wearing a super-ultra-mega-awesome shirt with a unicorn, a rainbow, a castle and a waterfall on it. RECOGNIZE! 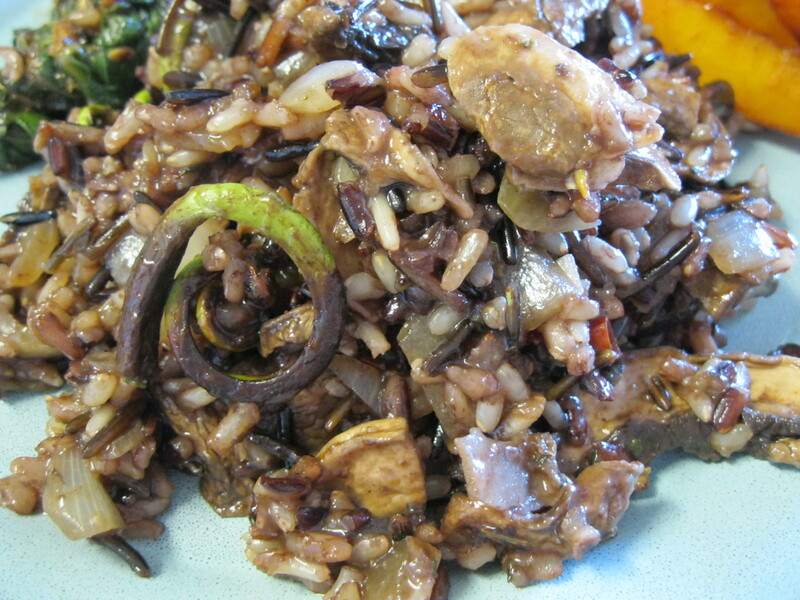 Mushroom Wild Rice: What’s not to like? We served this along with Brent’s BBQ butternut squash ribs and the savory earthy mushroom wild rice was an excellent addition to the sweet, spicy, smoked tartness of the “ribs”. You’ll need the following for the rice. 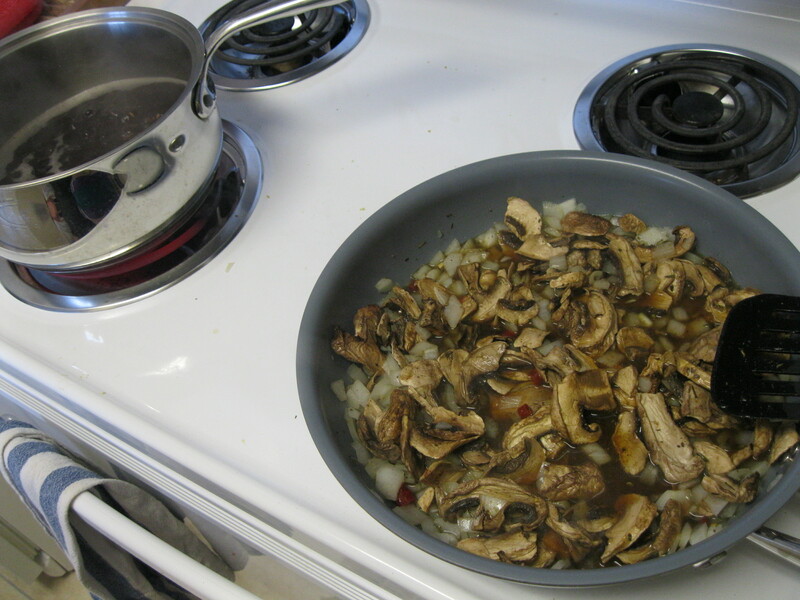 I sauteed the garlic, onion, peppers and herbs in olive oil over medium heat until it became fragrant and then I added the mushrooms. 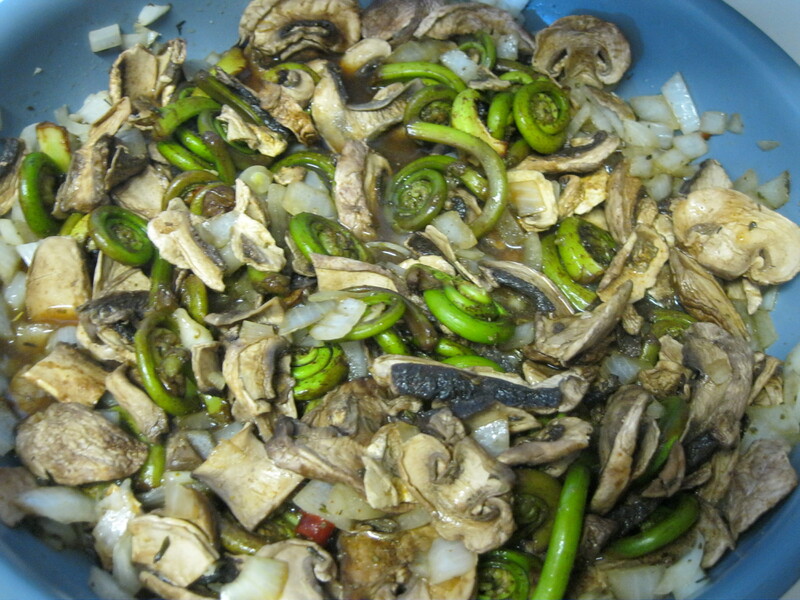 I stirred until the mushrooms were reduced and then I added the fiddleheads and turned the heat to low to allow the fiddleheads to soften lightly. They can turn brown quickly, so be gentle. 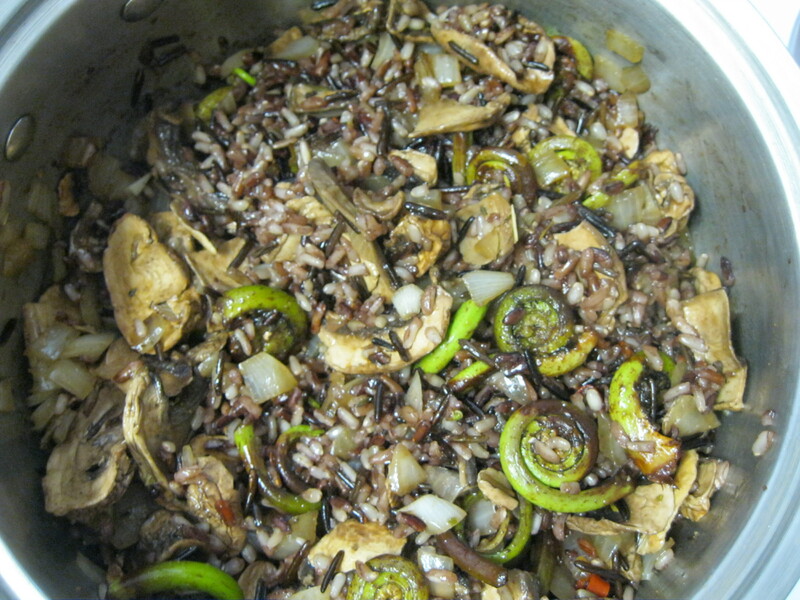 We mixed the mushroom mixture into the rice and served. The herbal flavors of the thyme and sage brought out the earthiness of the mushrooms and complemented the flavors in the fiddleheads. The nutty and savory flavors in the rice rounded the whole thing out and made it really rich and decadent. We’re still awash with fiddleheads and ramps so we’re finding ways to add them to things we already love to make them more exciting. This was a night when we were in a hurry so we did something quickly. 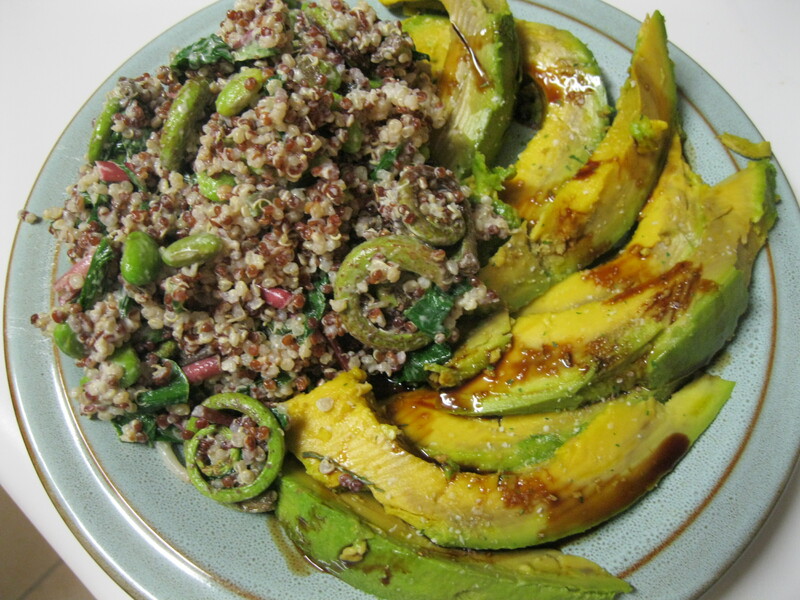 Brent prepared quinoa with the following ingredients. 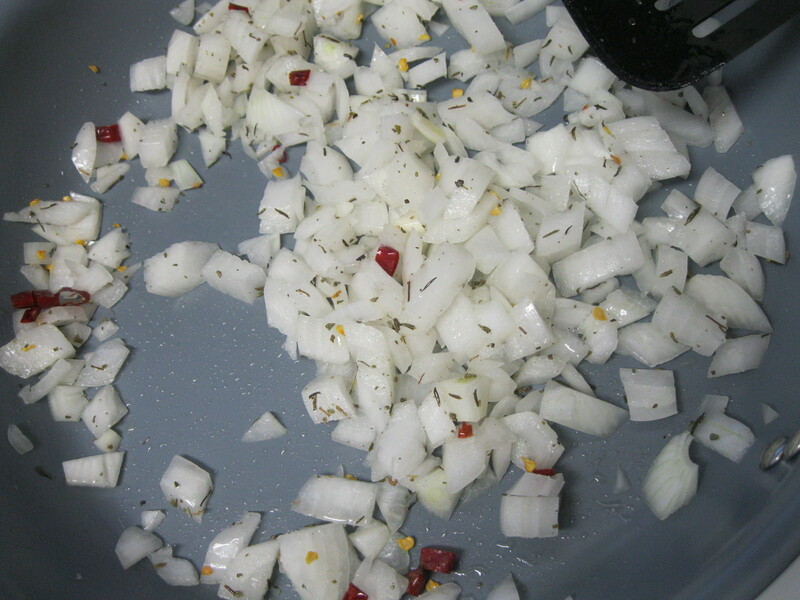 I sauted the onion and garlic with Earth Balance buttery spread until the onion began to caramelize. I added the fiddleheads, edamame (white Northern beans would be a great substitute for those with a soy allergy) and ramp bulbs until they began to soften. 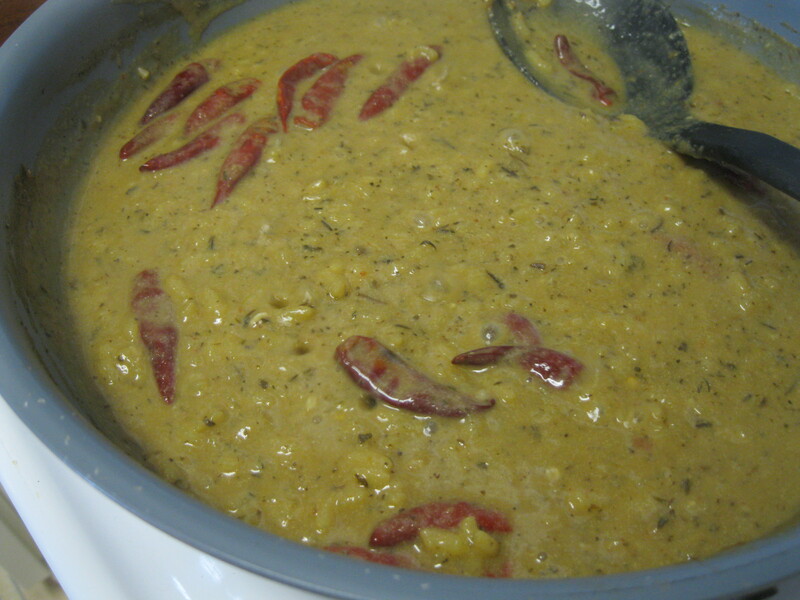 I added the ramp leaves and cilantro and stirred until they wilted. We combined this with the ramp stems, mayonnaise, and quinoa and devoured it. I put a sliced avocado drizzled with balsamic vinegar and sprinkled with garlic salt on the plate too for even more omega fatty acids: nourish your brain! 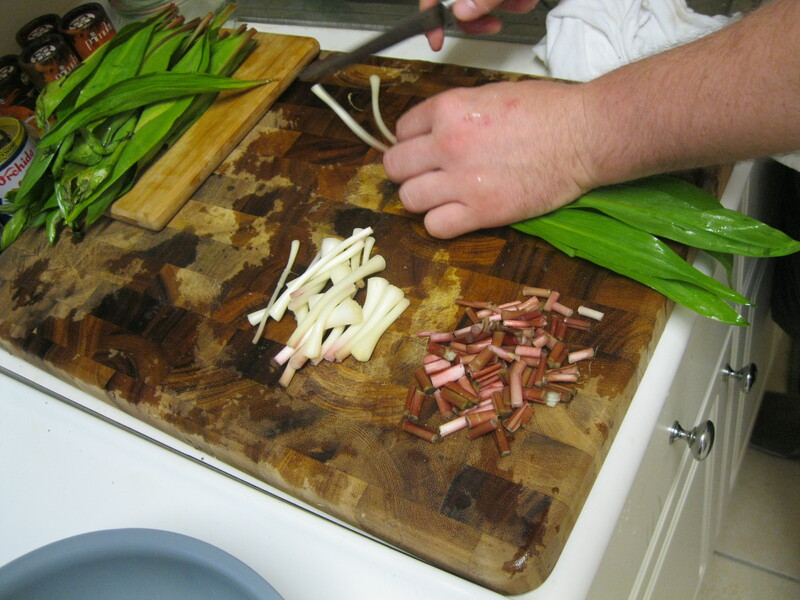 You can do this with spinach, asparagus and scallions instead of ramps and fiddleheads. There were no leftovers and only 2 survivors. 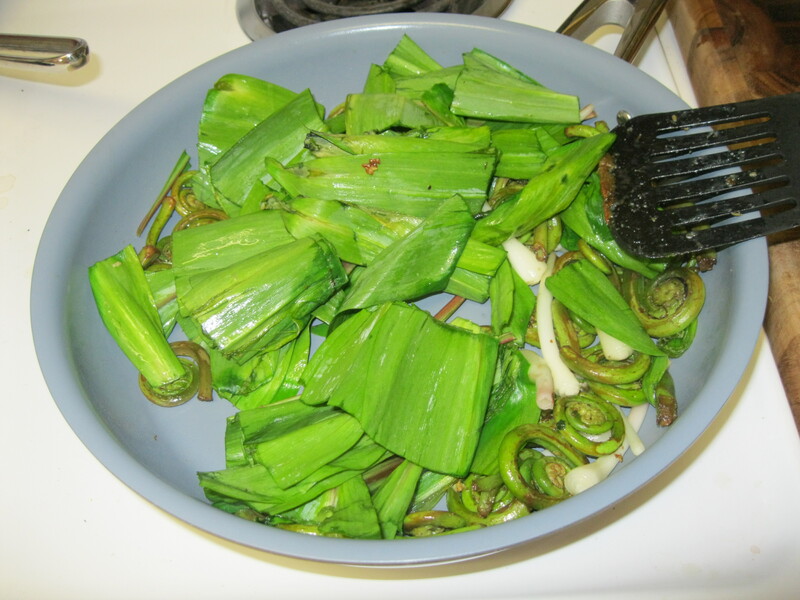 Fiddleheads and Ramps: Wild Harvest! 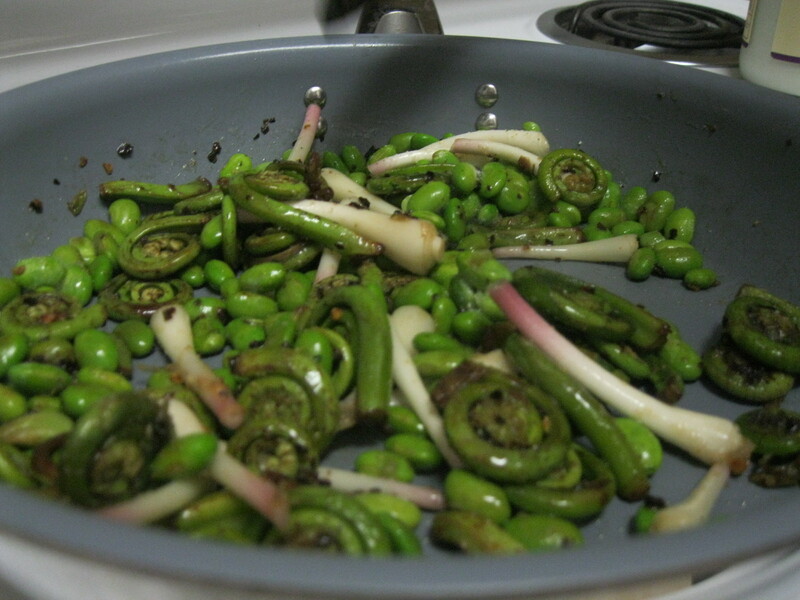 Nothing screams spring to me quite like fiddleheads and ramps. 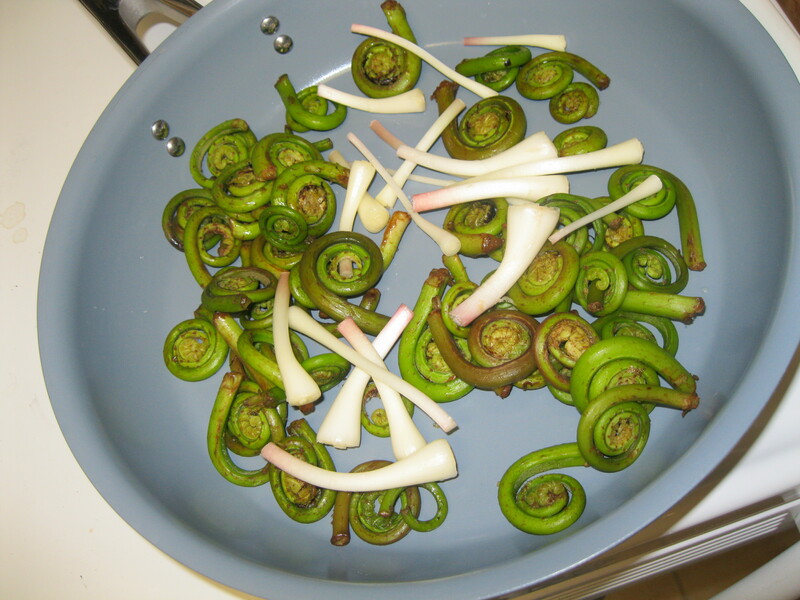 Fiddleheads are the newly budding tips of ferns that are common to the Northeast and ramps are wild leeks. The two make a fabulous pair and can make any meal visually stunning and delicious. Fiddleheads are the easier of the two to recognize. They can be harvested from several different varieties of ferns: cinnamon fern, royal fern, zenmai and vegetable fern. These grow all over the world but aren’t cultivated by farmers. 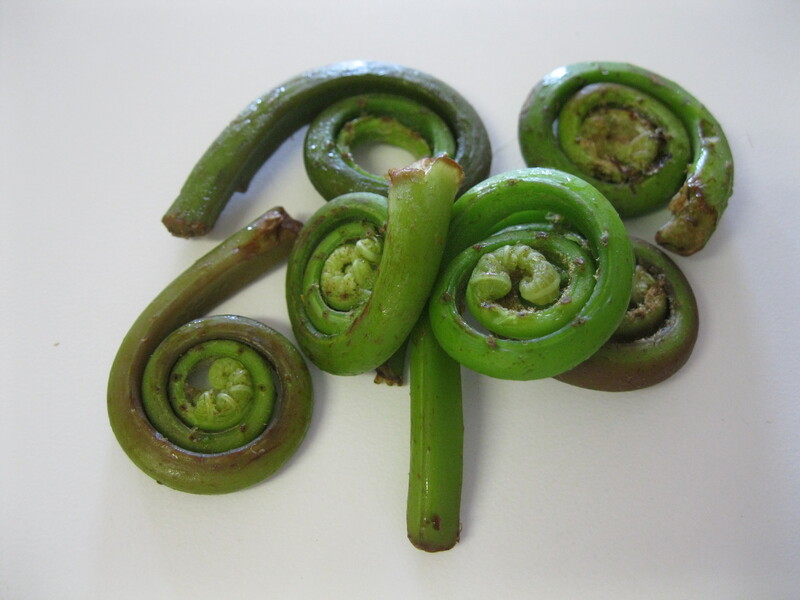 If you decide to harvest your own, the rule is to harvest fewer than half the fiddleheads from any one plant to allow the plant to survive the assault and produce again the next year. Be careful that you know your ferns, some are thought to be carcinogenic; specifically ostrich fern and royal fern. That being said, this isn’t quite as harrowing as hunting wild mushrooms. Note which varieties of ferns grow in a particular area when they develop fully and then you’re set for the next spring when you go fiddlehead hunting! Caveats being made, these vegetables are an incredibly tasty, nutritious and filling addition to any meal and they also can be stored by freezing. 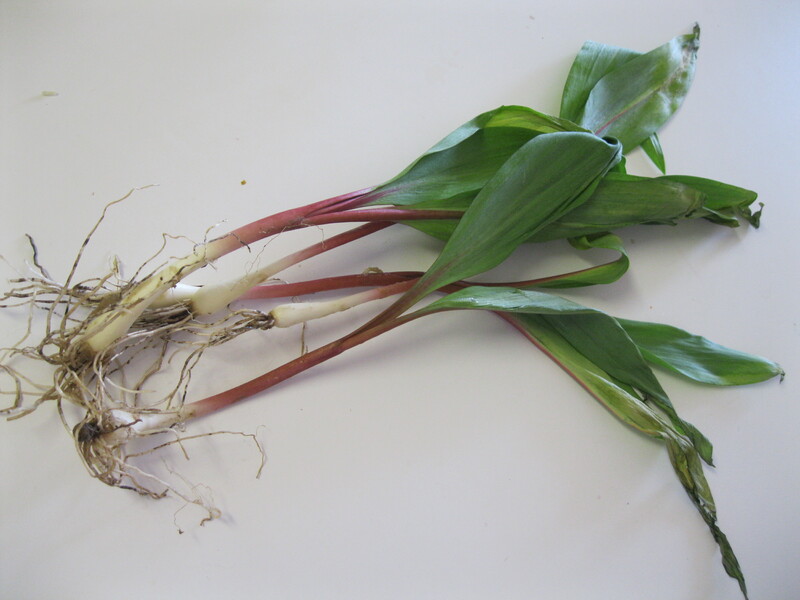 The flavor in ramps varies from root to tip. The bulbs have an intense and unique flavor that marries the best elements of onion and garlic. The stem is reminiscent of scallions and the leaves remind me of spinach with a touch of asparagus flavor. Subsequently, I advocate using as much of the plant as possible since the entire plant is harvested and the whole thing is delicious. When I was a kid we would make this dynamic duo into a salad with chicken and toasted nuts. I loved the flavors but was terrified of chicken and egg products that sat at room temperature for hours and hours. Horrifying thoughts aside, Brent and I decided to try it with soy curls instead and were delighted with the result. To start you’ll want to gather the following ingredients. 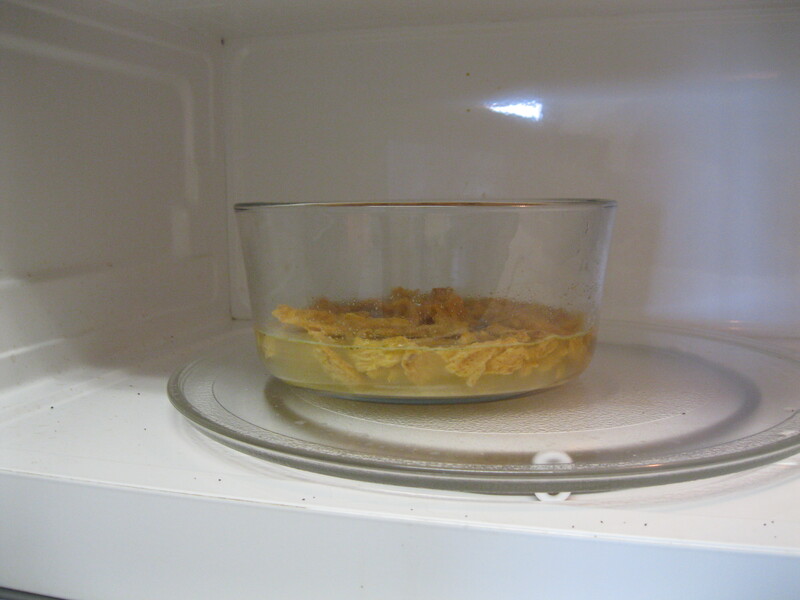 Prepare the water and bouillon in your microwave in a microwave safe bowl. Heat the water at one minute intervals until the bouillon dissolves with light stirring. Add the soy curls. Heat as before until the water is mostly absorbed. Saute with olive oil until lightly browned and crispy. I like to refrigerate this dish in order to cool it, but this salad is also delicious when warm. and fiddleheads until the fiddleheads start to get tender. Add the greens and stir until they wilt. Refrigerate to cool, if desired. Combine the soy curls, greens and red stems with the rest of the ingredients. We used Follow Your Heart grapeseed vegenaise. It’s pretty awesome. We also omitted the cranberries. 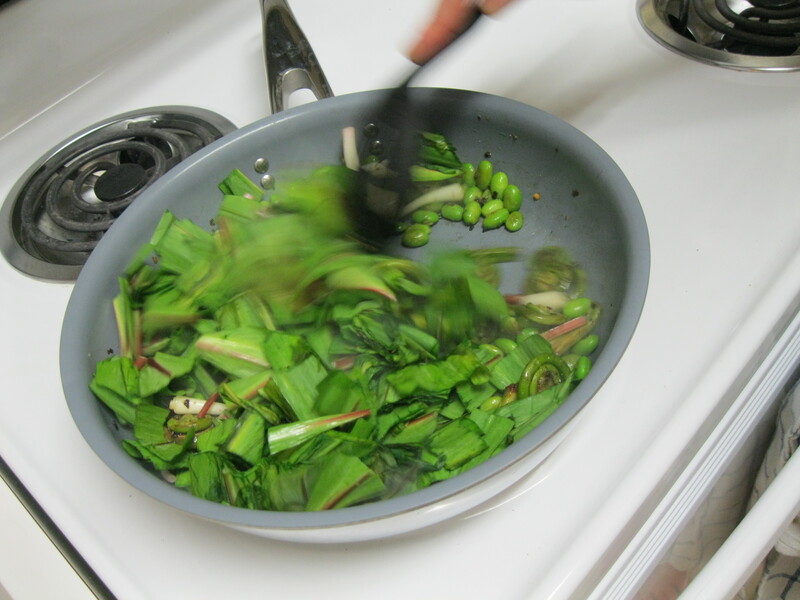 Serve on toasted bread.If you don’t have ramps and fiddleheads, substitute asparagus for the fiddleheads, spinach for the ramp greens, green onion for the ramp stems, and leeks for the ramp bulbs. Wow… that’s way more complicated. If you’re sensitive to soy, seitan or chickpeas would make a great substitute for soy curls. If you’ve got an allergy to pecans, toasted sunflower seeds have a great flavor and crunch. Really, this stunning and delicious. 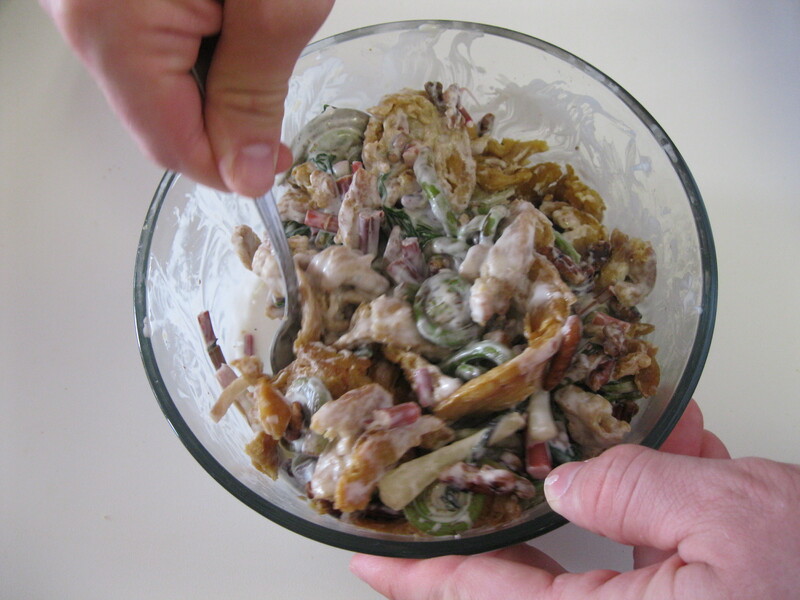 It was crisp herbal flavors married to the nutty savory soy curls all mellowed out by lemon and vegenaise. We had it with a crisp glass of red wine and savored a lazy Sunday.